Today I have the good pleasure of introducing you to my guest Rebecca Walser and share our conversation about a few steps that can help you with creating more wealth in your life. 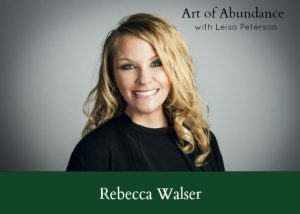 Rebecca Walser is a tax attorney and Certified Financial Planner who recently released the book Wealth Unbroken – Growing Wealth Uninterrupted by Market Crashes, Taxes, or Even Death. Rebecca is known for her weekly “Smart Money Mondays” segment on the nationally syndicated “Daytime” television show seen in over 70 markets, she has also been featured in US News & World Report, Bloomberg Business, New York Post, New York Daily News, Yahoo Finance, ABC News, NBC News, CBS News, FOX News, CW, Miami Herald, Boston Globe, LA Daily News, International Business Times, Investing Daily, Street Insider, and numerous other media outlets. The post AALP 180 – Wealth Creation Strategies with Rebecca Walser appeared first on Wealth Clinic.